A combination project of art and science. After studying the water cycle, we painted watercolor pictures of landscapes that included rivers, mountains, sky, and plants. Clouds and precipitation were added with white and gray acrylic paint after the watercolors were dry. Labels were written with Sharpie pens. Summer art project. Size is 3 feet across by 4 feet long. Project time was approximately 6 weeks, working 10-15 minutes per day. Tape wax paper to wall with painters tape. Tape bulletin board paper over wax paper. (The wax paper prevents any paint from seeping through. If you have a large roll of butchers paper / freezer paper with the waxed backing, that can be used as well). Choose a scene and animals. Print out images from the internet to find poses and colorations. Sketch a background. (In this case, Mom sketched the dock and the horizon line). Have kids take turns sketching animals, plants, etc. I suggest only one child working at a time, unless they are feeling particularly chummy! After all sketching is done, paint animals using acrylic paint. Have the kids mix all their own colors using only primary colors (blue/red/yellow) with black and white for dark/light tones. Paint background objects using acrylic paint. Paint water using watered-down watercolors. The watercolor can be washed over everything, so neatness is not needed. Waves were added in with acrylics later. Small details can be added with paint or even sharpies if needed (we sharpied in the herons’ orange eyes). What does early dictation look like? Here is a snapshot of where we are right now with my youngest kids. We practice dictation 3 days a week, usually M/W/F. I work with each child to choose a sentence from a book they are currently reading, usually from the most recent chapter. They have a moment to study it, then we dictate. The kids love using dry erase for this. I don’t know why. But it works! Step 1: Dictate the sentence. After they complete their best work, I give them the book to proofread the sentence. We talk about errors. In the picture below (8 year old boy), we discussed the use of capital letters. Step 2: Quick grammar lesson. We start with “circle the nouns” and move through the parts of speech slowly, over a year or two, depending on aptitude. The picture below is my 10 year old daughter. She can identify all 8 parts of speech, with the exception of some tricky adverbs. However, her handwriting skills have been slow to develop, so she is still doing very short sentences. I keep Grammar Concept checklists for each child to remind me which concepts they might need to learn next. I will often guide them to a sentence that suits me. If you don’t like the idea of choosing sentences from a book, I have some links to sentences on my main Dictation page. This week in Math Art we created an art panel to illustrate a multiplication fact. Our plants had leaves broken into 2 sections; each section was doodled differently. The students multiplied the 2 sections by the number of leaves they created to figure out their math fact. *It is important to use a permanent ink pen, or the doodles will smear when mod podge is applied. Paint cardboard with gesso to prime it. Let dry. (Use hairdryer to speed up drying time). Paint a background color on cardboard with acrylic paint. Let dry. On colored paper, draw leaf shapes. Divide each leaf shape into sections. You may choose 2, 3, 4 or more sections. Each section will be doodled differently. If you are working on a specific math fact, instruct the students to divide their leaves into that number of sections. For example, if you are creating, 6×4, you may have 6 leaves each with 4 sections, or 4 leaves each with 6 sections. Decorate the leaves by doodling each section with zentangles. Previous blog entries on zentangles include Purposeful Doodling, Today’s Doodles, and Doodle Animals. 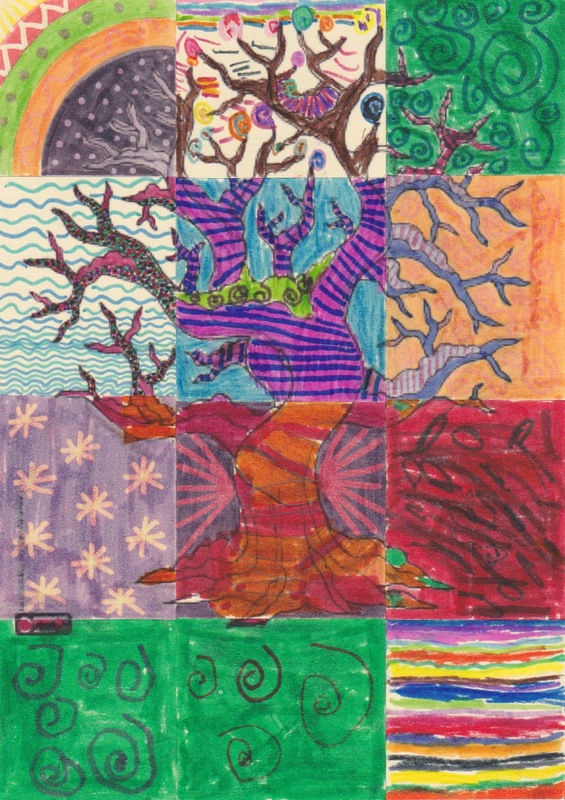 We like the “Zentangle Basics” workbook series for doodle ideas. You can find many zentangle patterns for free on the internet as well. Cut out a slightly larger leaf from the decorative paper to mount under the doodled leaf. Cut out a stem shape. 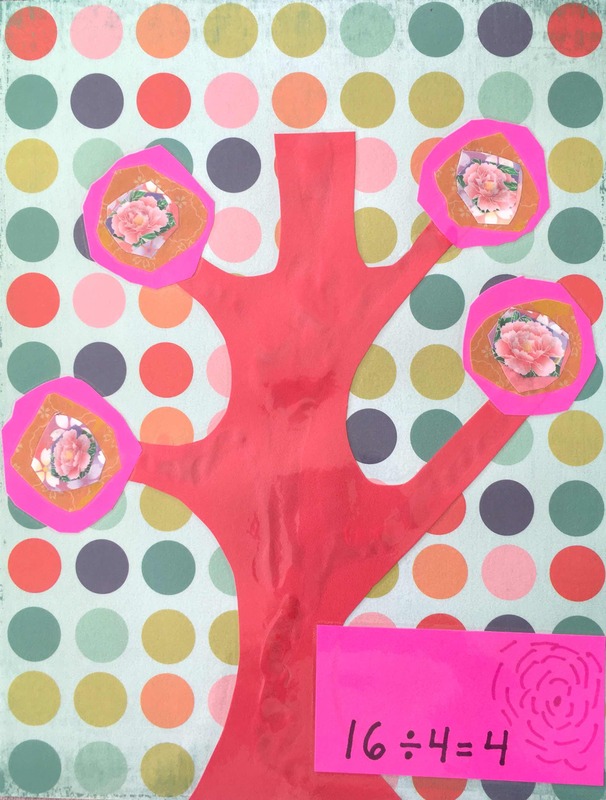 Use mod podge to apply all shapes to the dried cardboard. Write out the math fact and mod podge it on the cardboard. Our project this week was based on the book “Picture Pie” by Ed Emberley. Picture Pie helps the reader create simple pieces of art based on the fractions of a circle. While these look simple, the execution can be quite tedious. Below are the details for a simple bookmark. Teach a short lesson on the fractions of a circle. Have kids use the circle punch and scissors to cut up and sort fractions. 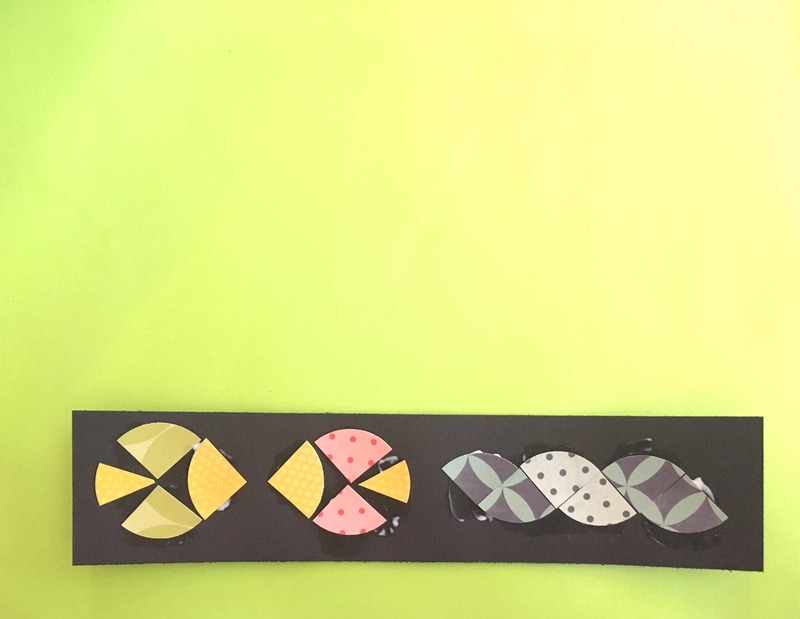 Choose pieces for the Fraction Fish bookmark. This project requires 12 quarters and 2 eighths. Arrange pieces in desired configuration. Glue onto bookmark. Let dry. Laminate if desired. (If you choose not to laminate, press the dried bookmark until all pieces are nicely flattened). This summer we are hosting a small “Math Art” class for a few of our friends. 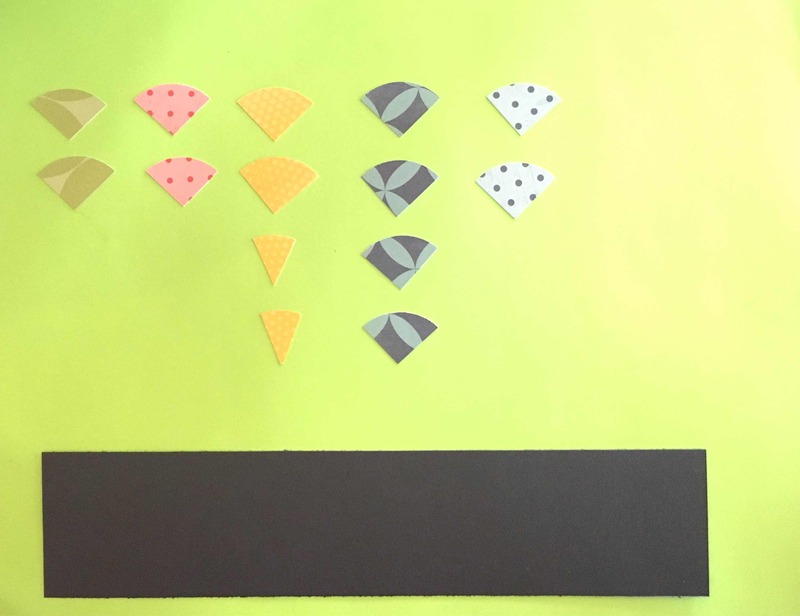 Each week we will create a math-themed art project (or an art-themed math project!). For Week 1 we created a mixed media board that illustrated a Number Bond. Each student picked a Number, then cut numbers out of newspaper and magazines to show at least 4 “ways to make” their chosen Number. The ages of these kids were from 7 to 11 years old. Cut pieces of cardboard from old boxes. Let dry, about 15 minutes if the Mod Podge is a thin coat. Trim edges. Paint the background with watered down acrylic paint. If the paint is too thick to see the background, wipe some off with a towel. Have each student choose a Number. On a piece of paper, have them list at least 4 “ways to make” that Number. Provide magazines, newspapers, and scissors to hunt for numbers. (The weekly ads are a great source!) They can keep track of the numbers they have found by laying them on the paper where they wrote their answers. When the background paint is dry, use a pencil to sketch the body of a dragonfly. Paint the dragonfly body with acrylic paint (NOT watered down!). I place a dab of red, yellow, blue, and white paint on a piece of wax paper for each child, and let them mix colors as they wish. Have each student look through magazines to find a pretty pattern for wings. Cut wings and set aside. Once the paint is mostly dry, use Mod Podge to attach the numbers and wings. After all paint is completely dry, you can Mod Podge over the entire piece as a finish coat.